A bathroom remodeling job can range from a few superficial alterations to a complete makeover. An old bathroom isn't just an eyesore in your home, it can also be difficult to use and decrease the value of your home. 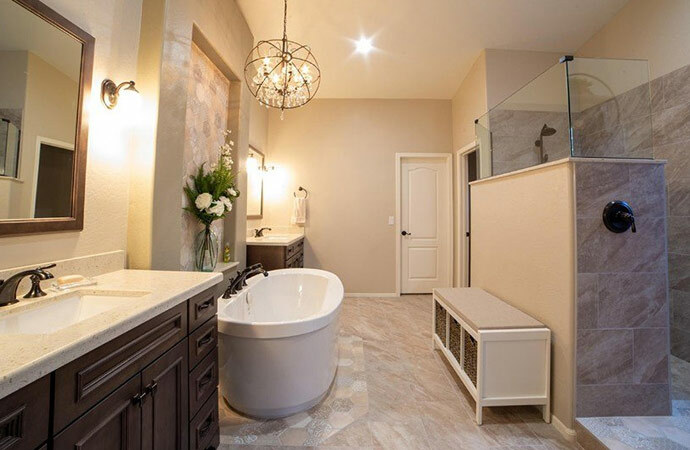 More and more homeowners are choosing to remodel or design a new bathroom to make their lives easier and their homes more beautiful. Great Lakes Home Renovations is your local expert for all of your bathroom remodeling needs. From conception to completion, we'll be sure to give you the perfect bathroom. 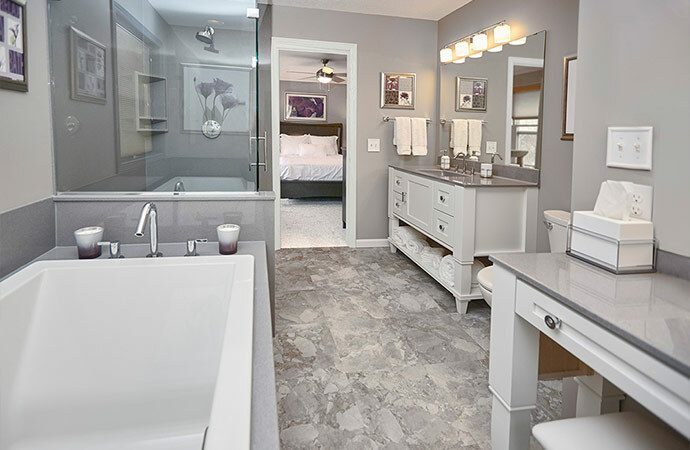 Whether you're looking to install new fixtures, convert a tub to a shower, install new vanities, or bring any other idea to life, we'll make sure your bathroom is easier to use, clean and maintain, and that it's more beautiful! If you're interested in learning more about our services, call and schedule a free design consultation or free estimate today! We serve homeowners in Saint Paul, Minneapolis, Apple Valley and surrounding areas. Solid surface replacement tubs, showers, tub liners and surrounds are made of non-porous, super strong virgin acrylic. Acrylic is a great material to use in a tub or shower area because it won't mold, mildew, stain, crack, or chip and it's easy to clean with little maintenance. We have many stylish color options and tile patterns, so now you can have the look of different tile and stone designs without the tiresome scrubbing and annoying maintenance of ceramic tile with grout or natural stone. The Onyx Collection offers a beautiful, solid-surface stone and resin composite that comes in sixty colors and five patterns. We use the Onyx Collection for surround walls, shower bases and vanity tops. Like acrylic, the Onyx Collection's surfaces are easy to clean and maintain because they are solid-surface. All of our solid surface materials are guaranteed with a lifetime manufacturer's warranty! The Onyx Collection proudly manufactures top of the line shower pans and bases, tub replacements, lavatories, tub surrounds, slabs, seats, trim and other shower accessories to your exact specifications. Our products are available through dealers throughout the continental United States. Tub to shower conversions: Bathtubs are becoming more obsolete for many people, and can end up just getting in the way and taking up unnecessary space in a bathroom. We can turn your tub into a shower by working with the existing tub apron or installing a new shower base. Bathroom vanities: The right vanity is essential to completing the bathroom. We can install all types of vanities and even provide you with a custom top. We work with quality solid surface materials that provide excellent beauty and durability. Liners, enclosures, and surrounds: These features help your tub or shower feel like it's a part of the rest of the bathroom. We offer a variety of tub and shower surrounds, shower enclosures, and tub liners to allow you to create the perfect design for your home. Flooring: The right flooring is a crucial aspect of any bathroom. We can help you find the right color and style to match the rest of your remodeled space. If you're unsatisfied with the state of your bathroom, there's simply no reason to delay a redesign or remodeling project. You'll see the benefits for years to come as your bathroom continually provides happiness, beauty, and value. Great Lakes Home Renovations is a professional remodeling company more than ready to help with your bathroom remodeling needs. Call or email us today to schedule a free bathroom evaluation and design consultation in Apple Valley, Saint Paul, Minneapolis, Burnsville, Eden Prairie, Lakeville, Andover, Osseo, Mankato, Hopkins and nearby!